Started the Paytm MINI and full KYC which can now make you Paytm MINI and FULL KYC. To Paytm Mini KYC you must give an identity card. You can get a PAN card, NREGA like identity card, passport, voter identity card, paytm Wallet, and driving license. You can request the Paytm Executive to come to your address. If this option is not available in your city, you can check out the option of Paytm to locate the KYC center to complete Paytm KYC! Install and Open the Paytm App. Login/Sign up your Paytm account. Enter your Paytm Number and Enter the OTP. Now Select your Document type and Put the Document number and Submit. That’s it, Your Minimum KYC is updated and valid for 1 Year. 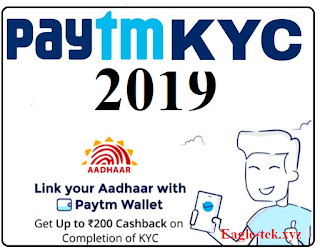 To Complete the Full KYC, Goto On HomePage Click on “Passbook” >> Paytm wallet >> Send money to the bank and Enter your Aadhaar Card number and Name and Click on Proceed and Follow the Steps to complete your KYC. You can also go to Menu >> Nearby and Find the Nearest KYC Center to Complete your Paytm KYC Process. Once your Paytm KYC gets Complete, You can avail Cashback offers on Paytm.